River Valley brought home first place at the Beta State Convention. 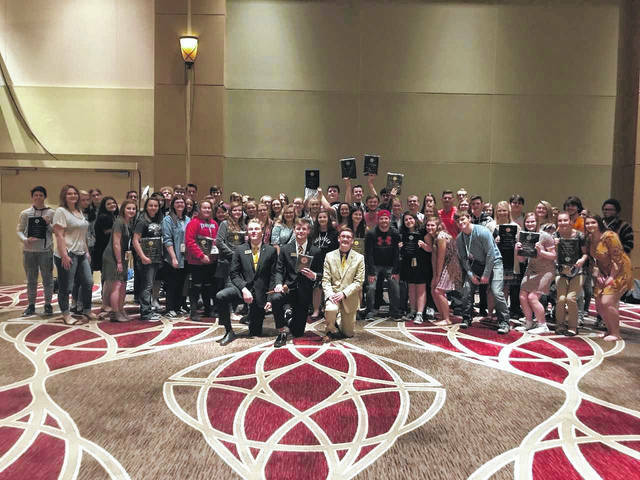 COLUMBUS — Gallia County Local Students traveled to Columbus last week to compete in the Ohio State Beta Convention. While competing at the state level in areas ranging from academics to performance art and character development, South Gallia and River Valley students took the podium with second and first place finishes, respectively. For River Valley, this is the second year in a row they have won the overall competition as a club, placing in the top three in 18 different events. They not only had students competing in the academic and talent categories, they also had students running for office. In Sunday’s edition of the Sunday Times Sentinel, a story focused on Ian Eblin succeeding in the new leadership program through Beta. Ethan Browning, of River Valley and Chad Bostic, of South Gallia both ran for Vice President of the State Convention. Another highlight from the state convention was the River Valley group talent that performed a special rendition of the popular song about the National Suicide Prevention Hotline. A more in depth article featuring this ran in the April 19 edition of the Gallipolis Daily Tribune. Whitt has been active in the community raising awareness about suicide prevention.